Moving into the new house has been so great. New ideas spring into mind daily on what I can do with a room, how I can make it more like home, and where I can put something I love. Although, I have never been so indecisive in my life. I just do not want to make mistakes that I will regret in the coming months. So instead I spend way too much time shopping around, looking at decorating blogs, and scrolling through Pinterest. The basement is the only place that I have made big decisions in no time because I had no choice. My husband and I picked things out and designed the space in a matter of hours. It should be done in a few weeks and I cannot wait to share. I have started to narrow down a few things for the rest of the house. Starting with light fixtures. The house we bought was only seen during the day, so I never realized that the previous owners had taken most of the fixtures. Since it stays light out until 9pm in the summer, it has not been an issue. But come the Fall we will be eating and hanging out in a dimly lit space. 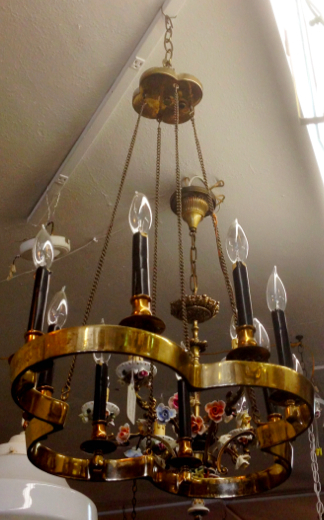 I came across this amazing fixture at one of my favorite antique dealers in Denver on a recent trip. It's clover shape is so unique and I just need to figure out where it is going to go. I also need fixtures in the hallways, kitchen (hanging between high beams) and a living room rug that can withstand traffic and babies for years to come. All are from Shades of Light. 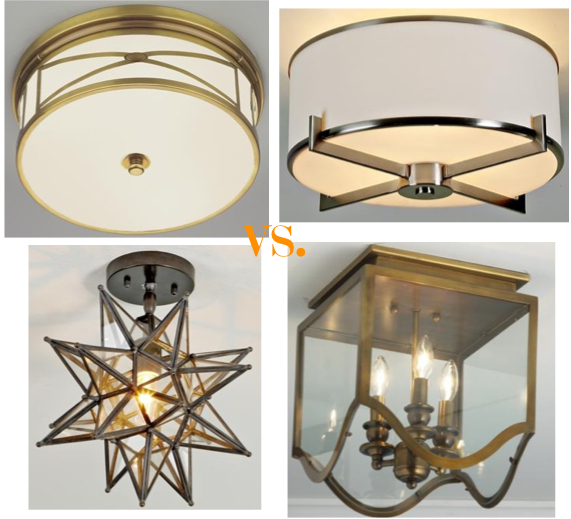 Our house has a country feel, which I like, but would also like to incorporate some modern, more contemporary fixtures. These are all so different, you can see how my mind is all over the place. Probably no closer to a decision. The kitchen needs larger, hanging lights that will peak between the beams that cut across the cathedral ceiling. I need three, so I am looking for quality without insane price tags. I am not crazy about the crystal hanging from the Orb Chandelier, but I figure I can take it off. The simple Jug light has a great industrial feel. And the Lantern is classic with a fun shape. I need a 9 x 12 that will stand up to stains and traffic. I am leaning towards these blue-grey options because the house is already painted cream with white trim. I probably will not get around to paint color selections until 2014 since those decisions are the hardest! Hopefully I can start sharing before and after pictures in the near future. As soon as I can start making decisions, my basement no longer has men working in it every day, and I can start picking things that I love and can live with forever. Or at least until the next re-do. Thanks for reading my venting and I would love to hear which items are your favorite. Sooo many great options, Erin! I love the clover chandelier - how unique & a great conversation piece. For the hallway I like either the top left (more traditional shape) or the star shaped light (it would reflect beautiful light rays onto the walls). 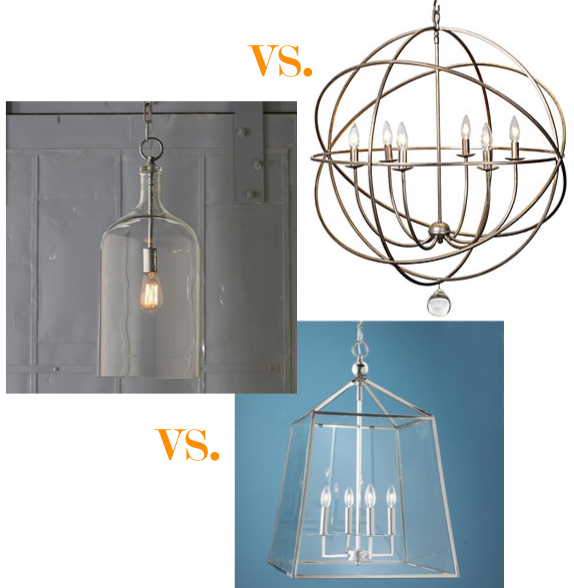 Kitchen - we have the orb chandelier in our entryway, but I think 3 of these would seem a bit overwhelming. I like the fun shaped lantern ones the best! 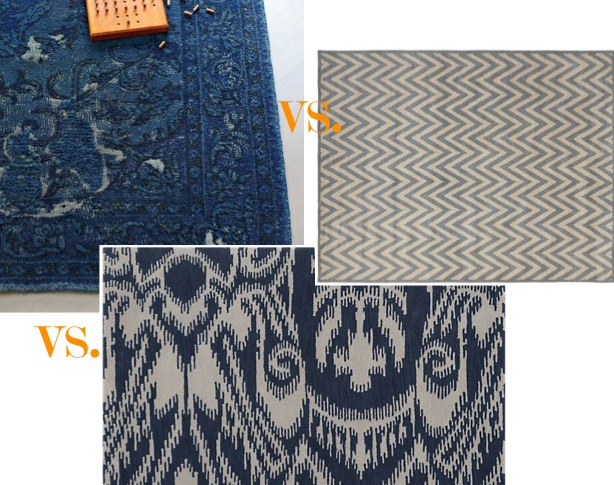 For the rugs - they are all gorgeous, but my fav is the left. It has the least amount of contrast so hopefully would do the best at hiding wear & tear. Good luck!! !